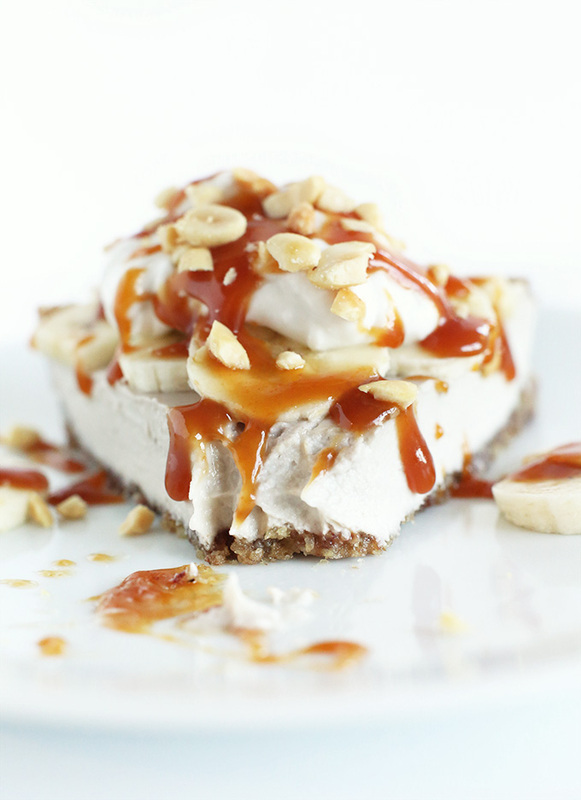 I love cashews, I love bananas, I love pie, and I don’t care who knows it! I truly do love bananas. I eat one nearly every day. 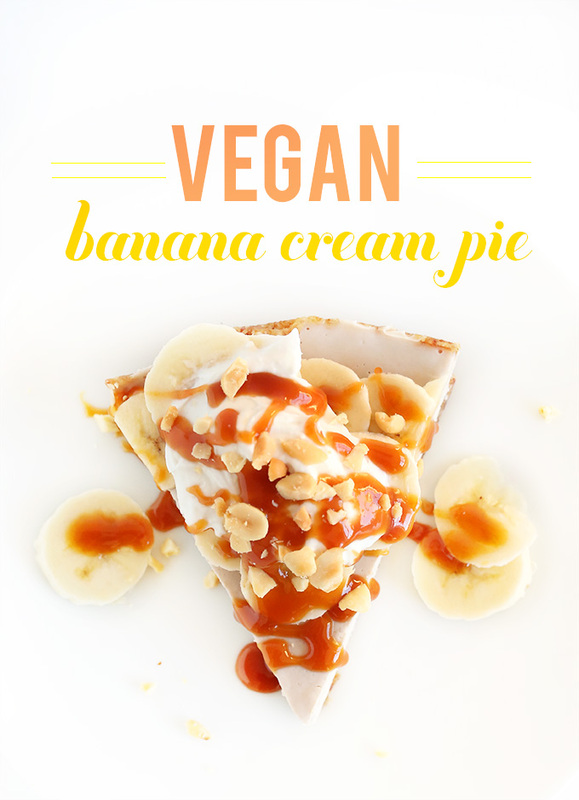 So it’s no surprise that my favorite pie is banana cream. But, since I’ve cut out mostly all dairy from my diet I haven’t attempted to make or even take a bite of a banana cream pie in years (*cue: tears). Friends, I was due. 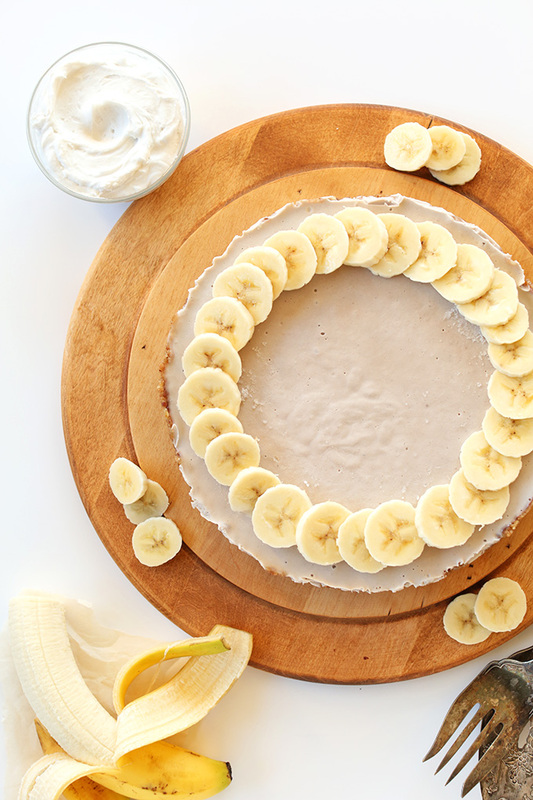 This banana cream pie requires just 10 ingredients including the crust! I was once skeptical of cashew-based desserts, but ever since trying these 7 Ingredient Vegan Cheesecakes my mind has been forever changed. The filling soaked cashews yield is just so creamy, silky sweet and luxurious you can’t beat it. You’d never guess it was dairy free. It doesn’t taste suspect at all. Especially when topped with coconut whipped cream, which is my best friend these days. The preparation is simple, too. Just process your dates and walnuts in a food processor and press into a springform pan, or a round pan or baking dish lined with plastic wrap if you don’t have a springform (hand raised). Freeze and forget. Then blend your filling ingredients until creamy and smooth. (You don’t need a Vitamix for this – just a nice quality blender. I use a Kitchenaid.) Pour over the crust, cover and freeze to set. Done and done. The result? Something straight out of heaven. & A dream when topped with coconut whipped cream, caramel, and crushed peanuts. I mean, I can’t make this stuff up. It’s just that good. Make this pie! You will love it…if you love bananas, that is. My sister balks at them. And she used to be allergic to peanut butter! I have no idea how we’re related. I guess our shared affection for desserts and coffee redeems it all. However, if bananas really aren’t your thing, fret not. Sub strawberries! Or mangoes! Or blueberries. Just pick your fruit and go. Cheers! 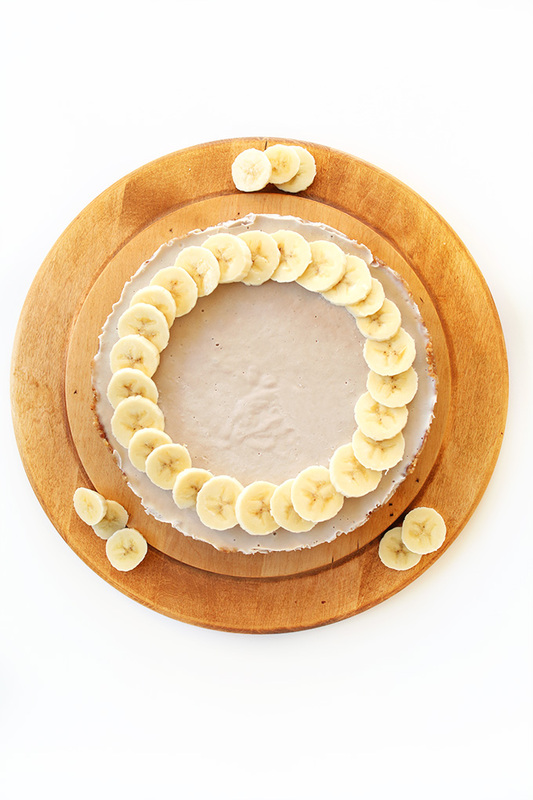 10-ingredient, amazingly healthy vegan banana cream pie. A 2-ingredient crust, 7-ingredient filling, and no baking means no mess and time saved. Simple dessert as its finest. Place soaked dates in the food processor and process until small bits remain and/or it forms into a ball. Remove and set aside. Process walnuts until a meal consistency is achieved. Add back in dates and a pinch of salt and mix to combine. When squeezed between two fingers, the crust should stick together and feel moldable. If too dry, add another date or two. If too wet, add a little almond or walnut meal. Press into a springform pan, or an 8x8 baking dish or round cake pan lined with plastic wrap or parchment (as original recipe is written // adjust number or size of pan if altering batch size). Press until flat, going up the sides about 1/2 inch. Place in freezer to set. 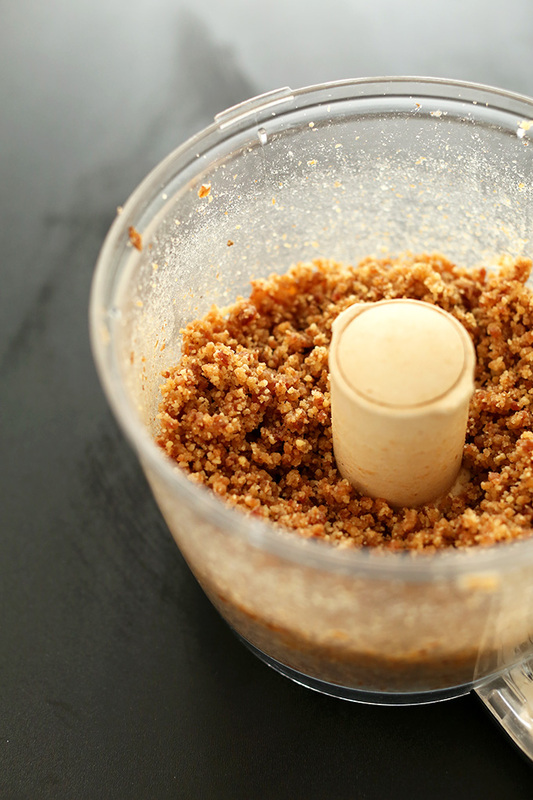 Add all filling ingredients to a blender and blend until smooth and creamy - about 1-2 minutes. If it's having trouble blending, add a little more agave or water to encourage it along. It should be silky smooth when completely combined. Taste and adjust seasonings as needed. I think adding a heaping spoonful of peanut butter at this point would be a brilliant idea. Then pour into crust and smooth with a spoon. Tap to release any air bubbles. Then cover and freeze until set - about 4-6 hours. To serve, let thaw for 5 minutes. 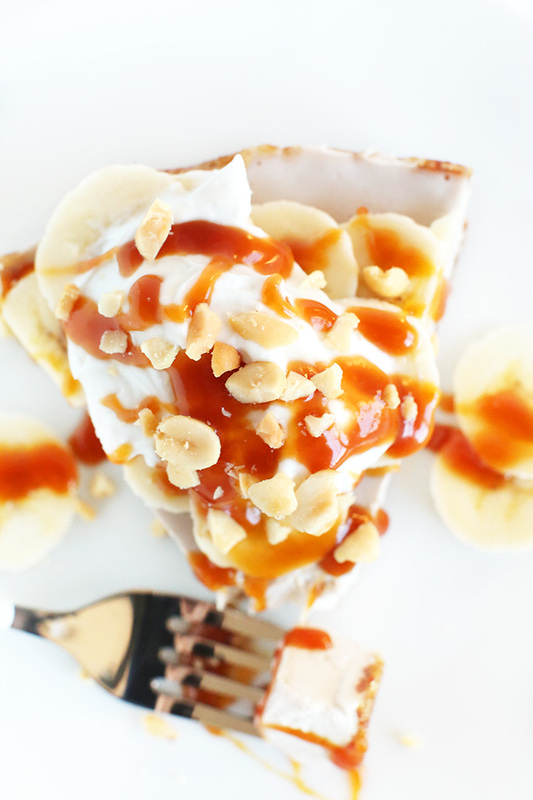 Top slices with coconut whipped cream, crushed peanuts and caramel sauce (optional). Should keep in the freezer, covered, for at least 1 week. *If your dates are already sticky and very moist, you don't need to soak them. *Sub strawberries, mangoes, or another fruit for bananas if desired. *Nutrition information is a rough estimate and does not include toppings. *Prep time does not include set time. Do you have to add the oil? Or is there something you can substitute for it? MAKE THIS RIGHT NOW! It is SO delicious!! I took it to a meet up with other families at the park. Everyone loved it, children included! I’m now making it for a second time this week! This occasion is to celebrate Father’s Day! You really can’t go wrong with this desert! *i subbed the agave/maple syrup for a 1/4tsp of stevia. Hi from Venezuela ?? the crust is Just dates and walnuts? And the topping coconuts cream ? I’m allergic to walnuts. Any other suggestions for the crust? Hi Savannah! You could try peanuts or almonds! when you say that you scrape the cream off of the top of the coconut milk…what do you do with it? Do you add it to the recipe? Hi ? This looks soooo yummy. I have all the ingredients but I don’t have agave or maple syrup. I just have stevia powder. Can I do it like that ? Thanks. Hmm I am not sure it will work the same. Report back on how it goes! When my husband taste the pie he tough it was cheesecake ? I’m planing to do it with mango next time. So glad your son liked it, Patty! Enjoy! I am having a house warming and planned to make your baked banana cream pie but then came across this one. I’m now torn on which one to make! Can you suggest which one I should go with? Both sound amazing and equally easy, I plan to make on Thursday evening to eat on Friday evening. I fail at making caramel so if I make this one I may just go with coconut whipped cream and bananas as a topping and call it a day. I love-love-loved this – it’s so creamy and the flavors are perfectly balanced. Plus super easy to make so that’s always a plus. :) Thanks for a great recipe! I made the pie last week and it was delicious! My only problem was the cream consistency. I followed all the steps, put the pie in the freezer for 4 hours but, five minutes after I’d taken it out for decoration, the cream softened up a lot and I wasn’t able to cut out solid pieces because of the melting cream. What do you think went wrong? Should I blend the cashews into a meal first and then add the rest of the ingredients? Should I use the coconut milk chilled so that it’s less milky and more solid? Should I leave the pie in the freezer longer? P.S. : I stirred some melted dark chocolate with a little coconu oil and used that as a topping, together with the bananas. Great combo! Amazing. Made this for a friend’s birthday and everyone was knocked for six. Just made a Valentine’s Day version, where the banana is replaced with an equal mass of strawberries and the crust uses 1/2 dates and 1/2 dried cherries instead of only dates. Goji berry powder over the top for color and a little sweet tang. Brilliant. I can’t eat cashews (or peanuts) and I just wondered what I could sub instead? Looks so delish! THIS IS AMAZING!!!!!! AND SO EASY!!!! Made this with high hopes…and wasnt the least bit disappointed!! Deeeelicious, healthy, and beautiful! Thank you so much for sharing this. Followed recipe exactly. The crust somehow tastes almost buttery. 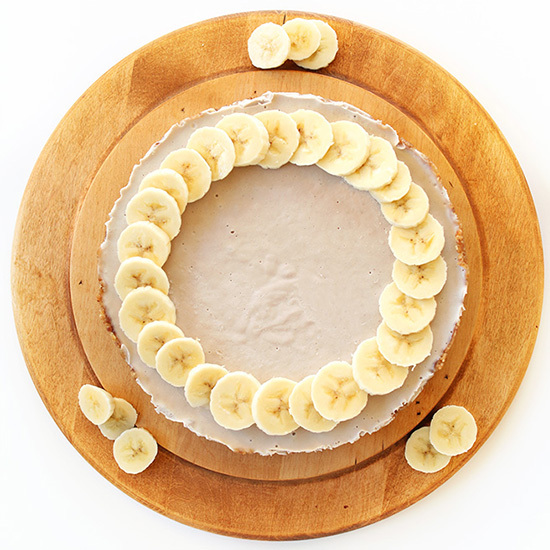 The filling was smooth and creamy with a terrific fresh banana taste. It was just the right amount of sweet (I used maple syrup) and I almost wished I had made a double batch so I could just sit there with my spoon eating the filling! 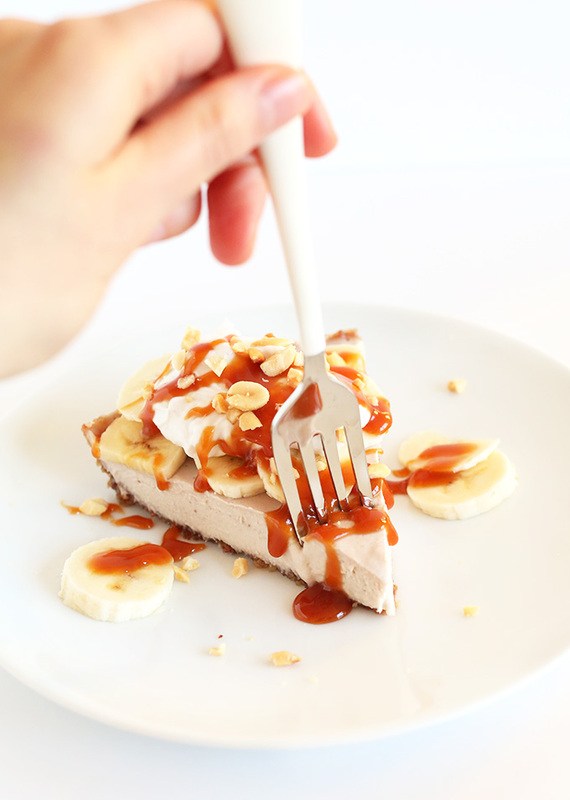 Delicious (we topped as pictured) with caramel sauce, fresh sliced bananas & crushed peanuts on top. Best part? No stomachache or headache afterwards, guilt free, and great for vegan friends, gluten free peeps and even those avoiding processed sugars! This looks amazing! But I have a question. Last time I made your cheesecake, the cream unfortunately tasted more like lemon juice! Can I just leave out the lemon juice in this recipe? This looks amazing…. If only it was free from nuts. Dumb question – totally new to the pie world. But is the plastic wrap so you can remove it OUT of the pan then onto a plate once it’s set? I don’t know what the best way to move it out of the pan to a plate or should I just leave it in the pan without plastic wrap? So you just scrape the cream off of the top from the coconut milk and throw it away? You can reserve the rest for things like smoothies. This looks amazing! I’m going to make this for my father, who has a dairy allergy. One question – Do you only use the cream of the coconut milk? Or do you use the actual milk? I can’t waittt to try this recipe ! Just one quick question. Can I use the simple graham cracker and Earth Balance crust instead? I made your mini vegan cheesecakes a few weeks ago and LOVED them. The crust was just a little much to me. If I can, do I have to bake the crust for a few minutes in the oven like you say to do for your mini vegan key limes pies? Or do I just omit that step to keep it raw. Thank you! Hi Dana, this looks so yammmmm…. can i substitute nuts for sunflower seeds if possible? do i need to soak those too??? Can I substitute almonds for walnuts in the crust? Walnuts give my hubby headaches. Just made the banana pie. Can’t wait to taste it. For the coconut whipped cream : I used NATIVE FOREST and it worked great!!! After a day in fridge galf the box was cream. . But in the future, Iwould less the lesser amount of sugar and a tiny amount of vanilla. The amount I did use overpowered the coconut. Thanks!!! Side note: I particularly love that your recipes are so “minimalist” – few ingredients, easy prep. Makes it easy for a non-vegan like myself to foray into vegan cuisine without feeling too daunted. I’ve converted many skeptical steak-and-tater people with the simplicity and quality of your stuff. So thanks! O my word! I just finished making this, and I can’t wait until it sets, because the filling is DELICIOUS and SUPER creamy!! The only problem, is that there didn’t seem to be quite enough filling for the crust. But, I made some coconut whipped cream, so I will add that to the pie as another layer, and top it all with some chopped peanuts. I ended up using a store bought graham cracker crust, but I definitely plan on making this again with the date and walnut crust. Update — I brought this pie to a BBQ, thinking my sister and I (the only vegans in the group) would be the only ones to really enjoy it, but it was DEVOURED! SCORE! Glad everyone enjoyed it, Laura! This pie sounds better than a traditional banana cream pie! I have a question, did you use raw cashews or toasted salted cashews, which I happen to have on hand.? Raw! Roasted won’t work in my experience. Did you put the bananas on top of the pie before you froze it or just to take the picture afterwards? I’d love to decorate it the way you did and freeze it but wasn’t sure if that would work. Awesome recipe. Tastes amazing and so simple, quick and easy to make. Highly recommended. Hey! What can we substitute coconut oil with? Also, can we use honey instead of agave syrup? Thanks!! DELICIOUS! My boyfriend was weary of “soggy cashew pie,” but he now admits its the best pie he’s ever had! I made this with 2 tbps of PB added and used a pre-made, organic graham cracker pie crust. So good for dessert and healthy enough for breakfast! Will be making again! For the win! Love it when it’s boyfriend/husband-approved. Thanks for sharing!! I want to make this for a dinner party this upcoming Friday. Do you think it will be okay to make ahead today (Wednesday) and leave it in the freezer till Friday night? Do I need to let it thaw before serving? Yes! I’d recommend thawing 30 minutes before serving. Good luck! Thank you so much! =D Made it last night. Can’t wait to dive face first into it! I just made this. It took all my willpower to actually put it in the freezer. The crust is heaven and the filling is exactly like banana pudding. When I went vegan I thought making pies was impossible. After making this I wonder why the hell I didn’t go vegan sooner! This looks amazing! Would I be able to sub the coconut milk for almond milk? this looks decadent. love how you used cashew nuts here. Terrific recipe! Thanks for sharing. My husband loves bananas and pie, so he’s in for a treat when he comes home tonight. I’m really hoping I havent messed this up. I added a little water to the walnut date mixture because my blender wouldnt blend them unless I added a little water or something to make it move, now my crust is moist and not dry, I have added the pie filing but wondered if I can put in the oven to make the pie crust crunchy?? I did not add the cashew part of the recipe. I came across this recipe searching for gluten free pie. I am. It much of a sweets person, but every now and then I crave banana cream pie. I used to hit the bakery and indulge in my in-healthy piece of heaven. After being diagnosed with a gluten and corn allergy/intolerance I was forced to make my own deserts…translation I did not eat them because why would I make an entire pie for one piece? After reading the reviews I decided to take the leap and make this pie….one word AMAZING!!! By far, the best pie I have ever eaten. (I subbed honey for the Aguave and used 1.5 large bananas and decided to go sans toppings). Super delicious and I love how creamy and light it is. I will definitely be checking out your other recipes!! 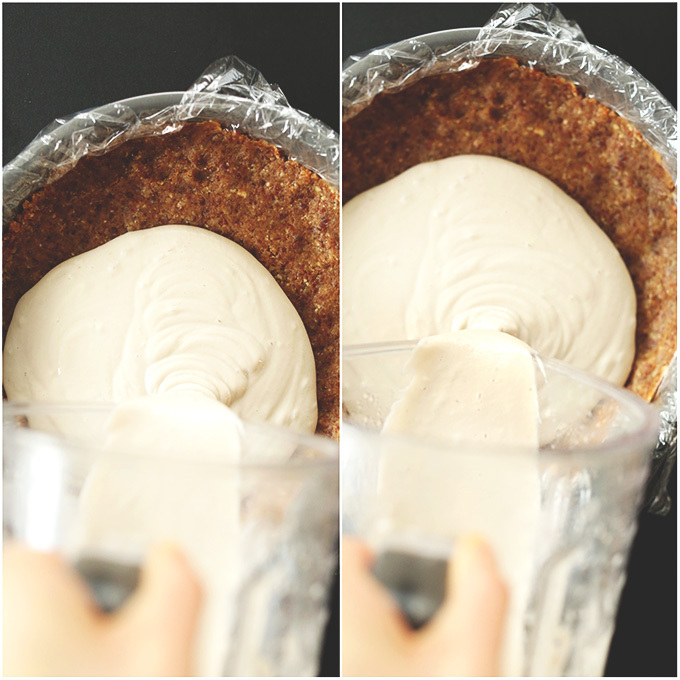 Yes, this pie is vegan…..but it’s not raw…coconut cream/milk in a can has been cooked. and definitely not raw. but it looks good. I would blend up the meat and water from a young Thai coconut and make my own milk….and you can make it as thick or thin as you want it. It tastes amazing. oh my! 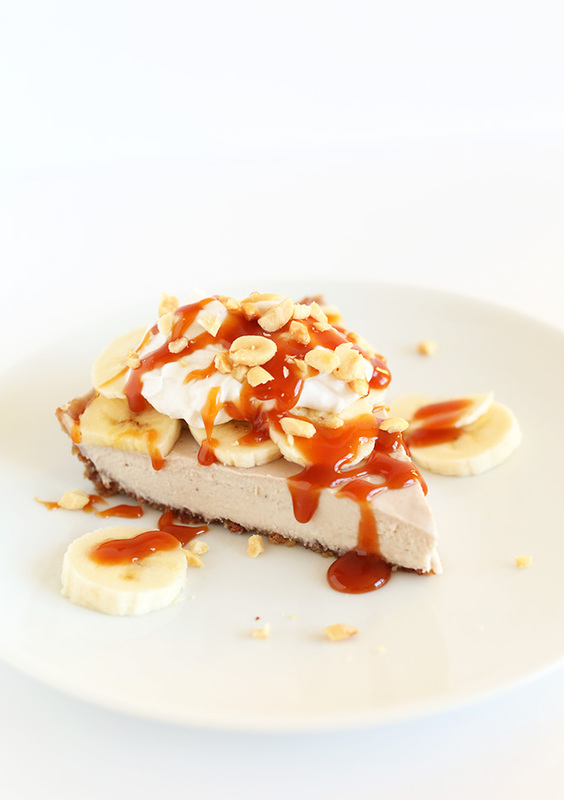 I made this, with a few modifications (subbed in 6oz silken tofu for half of the cashews; added a layer of nanas on the crust; splash of malibu to the coconut whipped cream)…and it was ah-may-zing! Will definitely be sharing this on my blog, and paying homage to your post :) thanks for the recipe and inspiration! My boyfriend’s family of long-time pie makers and lovers couldn’t even tell it was vegan…buahahahha! Love it! So glad you enjoyed it. Thanks, Annaliese! I made this over the weekend, and it tastes great! Mine just turned out a lot grainier than yours. I soaked my cashews over night, and I processed it for quite some time. Any suggestions to get it creamier next time? I also made your cashew-less queso, amazing!! Ha, sorry to tempt you with the sauce! So glad you enjoyed it, Keryn. Thanks for sharing! I am a bit prejudiced against walnuts, I have to admit. Would it be acceptable to replace walnuts with almonds? 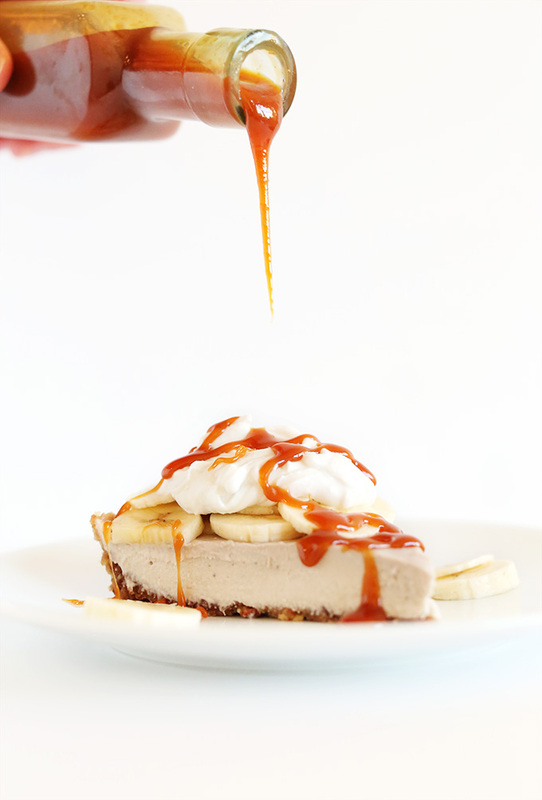 Could I use chocolate in place of the bananas to make it a chocolate cream pie? Oh good! Yes, you could do that. I also have a chocolate silk pie recipe coming if you can wait (no cashews involved)! 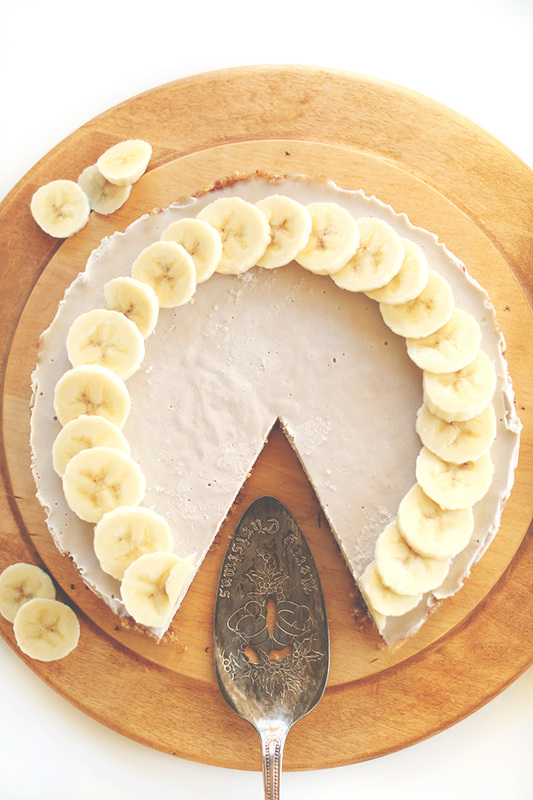 I’ve been meaning to make a raw cheesecake and this looks like perfection! I also love that your recipe doesn’t have half a cup of coconut oil like many cheesecake recipes of the same size that I’ve been seeing online. The coconut cream and banana probably help it set up nicely! I recently bought four 4.75″ mini tart pans and would love to try them for this recipe. Since your cheesecake says it serves 8 and I have 4 pans, do you think halving the recipe would fill the tarts/overfill/not be enough? Gorg pics Dana! I love a good “clean” dessert… pinning for the weekend! Everything about this pie is gorgeous. The look, the ingredients, the TASTE! I just made this, and it’s nearly gone!! Great recipe! I am officially obsessed with your site. Love to hear it! Thanks for sharing, Brittany! Hi, this looks amazing. I am allergic to cashews. Do you think subbing with macadamias will work equally well? Oh yeah! I haven’t thought of macadamias. I think either that or maybe even blanched brazil nuts might work! Thanks for posting this recipe – I really want to try it! Here’s my only question: I want to make the pie today, but serve it tomorrow evening. How long can I leave it in the freezer? Does leaving it in the freezer for 1.5 days mess with it? Do I still just thaw it for 5 minutes? Not at all! As long as you adequately cover it with plastic wrap or a freezer safe bag you’ll be good for a week or more! Just thaw it for 10 minutes before serving. Hope that helps! It’s also good straight out of the freezer if you’re OK with a slightly more firm dessert. This recipee just sounds great ! Do you think it’s possible de replace dates by dried apricots (soaked in water) ? Apricots are lower-GI than dates, that’s why I’m asking… Thank you ! Please do! One other person added banana chips and I thought that was a great idea! This shall be my birthday pie, too – I’ve decided! ;D Let me know how you like it, Katie! Wow this looks to die for.. I love the touch of the pie/cake server. It’s beautiful! I made this last night – very good!! It won’t last long! Yay! So glad you made and like it Auntie! Hi Dana, Thanks for the great photo and the scrumptious recipe . I just love raw vegan desserts like this , sometimes they are even great for breakfast after a green thickie . My husband will love this ! Thanks Dana . I cannot get over how stunning this pie is. oh my gosh. Everything about it looks just perfect. I love making raw vegan desserts – it’s amazing how decadent you can go. Thanks Abbie! It tastes as good as it looks. Thanks for the share! Yes! The coconut whipped cream trick is bomb. Also, if you live hear a Trader Joe’s their coconut cream is amazing and yields perfectly consistent coconut whipped cream. But as far as taste goes, Thai Kitchen brand still reigns supreme! Omg…this is setting in my freezer right now. I can hardly wait! The filling was so good, my husband couldn’t keep his fingers out of the blender (when it was NOT running of course, lol). I’m going to serve it with a warm peanut butter drizzle and coconut whipped cream. Thanks for the recipe! Ha! Love to hear it. Serving it with a warm PB drizzle sounds AMAZING to me! Let me know how you liked it, Sandra! I love this pie, I wonder if coconut cream on top of a “Veghead Lemon meringue” would toast up like the original, hmm, Yum ! Yum! I also LOVE bananas – don’t think I go a day without one. Cashew desserts are definitely awesome, love how easy it is to make dairy-free desserts. It’s been about 4 years since I’ve had dairy due to an allergy. I miss dairy but have learned to love alternatives because they leave me feeling so much better/healthier! Love knowing there are other people in the same boat so we can come up with awesome dairy-free treats together :D Thanks for saying hi, Alicia! I love the ease of raw, cashew-based desserts. And anything with bananas and coconut combined is awesome. The fact that cashews exist makes me beyond happy. Ha, me too! What would we do without cashews!? Omg. Every time you post something, I get awfully hungry…haha but I’m not complaining, definitely need to try this! Ha! That makes me happy. But sorry if I cause hunger issues! Thanks for saying hi, Melissa! I was already sold on this, but then I saw the picture of the caramel sauce pour and I nearly died. Ha! I nearly died when John was pouring it on. Then I proceeded to scarf that entire slice. So good! I have yet to make a cashew dessert but I have lots of raw cashews! 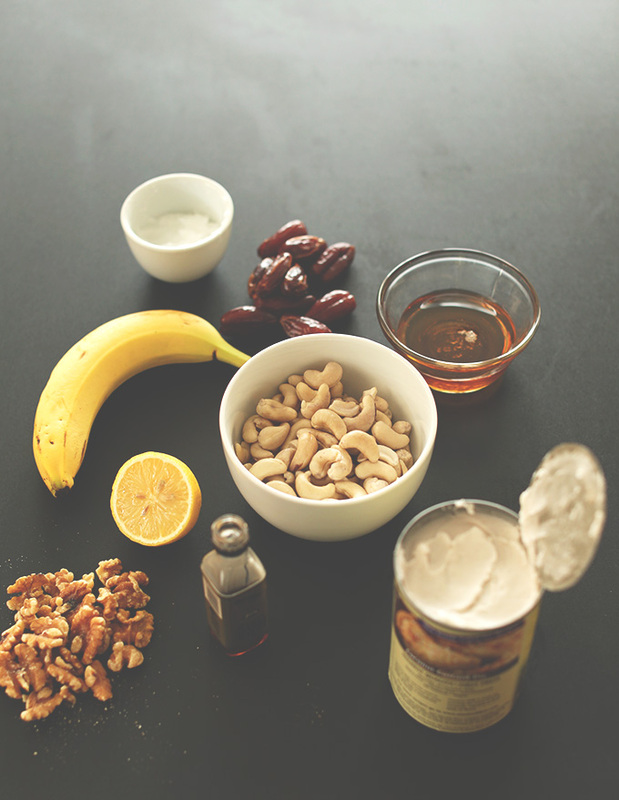 Do you know if the dessert will be the same if you use raw cashew pieces instead of whole ones? Their cheaper and just started selling them at trader joes. Thanks! Clarissa, I’m sure that would work. In fact, you may even be able to soak them a little less if they’re halved/pieces. Let me know how it goes! Hope that helps! Yes! I had cashew pieces, soaked them for only one hr (maybe even less)….they blended up super smooth & creamy! Tasted exactly the same too. 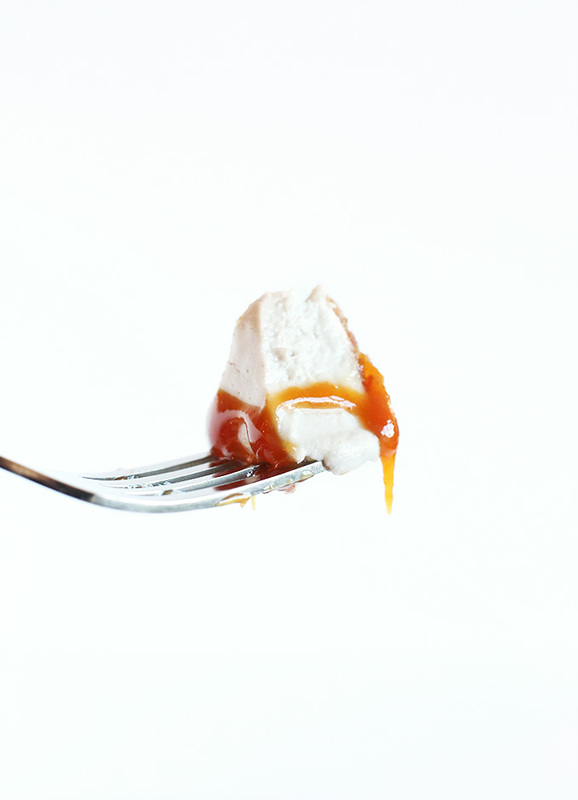 Oh no you didn’t with the caramel sauce. That put this over the top! Love. When I braved into the world of cashew based desserts it completely changed my life too! There is nothing like the creamy, rich texture and they are so versatile. Cashews are really like nothing else. Though I’d love to experiment with other nuts/seeds to see if they yield similar results! I love bananas! I love pie! Only thing missing is some peanut butter and a group of people that will eat this with me. Hopefully you have cool enough people in your life to come over and help you eat some pie. ;D Hope you enjoy this recipe, Shannon! this pie looks so creamy! i want one of those caramel drizzled slices NOW! How long can the pie stay out of the freezer once it has set? I’m thinking of making this and bringing some to work, but I don’t know if it’ll hold well enough. I would keep it in the freezer as much as you can. If you take it to work, it should be fine in the fridge. Left out on the counter it will get very soft. But if there’s a freezer handy pop it back in to help it hold shape! Holy Hannah. I need to explore with this cashewness. ASAP. You just said “holy hanna.” This is (one of the many reasons) why I love you. Do you think I could use peanuts in the base instead of walnuts or do they not really make a “mealy” consistency when processed? I’m just thinking maybe I might like a stronger peanut/banana connection. Okay actually it’s because I have peanuts and all the other ingredients in the house right now but no walnuts (last of them are in my banana bread granola) and although it’s 9.45 at night I could in theory still make this tonight… Is that wrong?! That would totally work! The only way it would be mealy is if you over-processed them. Just keep it to a rough “meal” and you’ll be fine! Great question (and brilliant idea). Hope that helps! It totally helps… I am in for some banana cream pie! Woot woot! Can’t wait…. Another great use for bananas. Yum! I totally understand and share your love of bananas – probably my favourite post (or pre) workout snack ever… or any time of the day really. 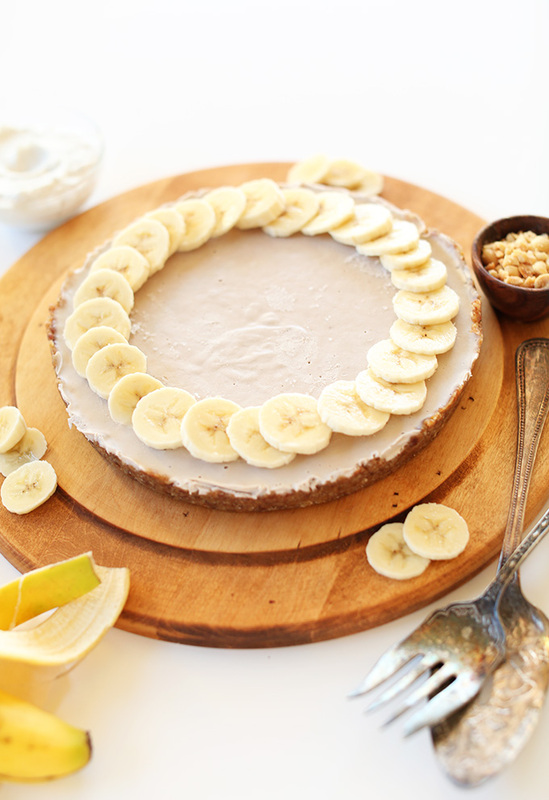 I love a good banana cream pie and it looks like you nailed it on making it dairy free!! This pie looks so unreal! I love the looks of this! Oh my gosh, I think I just died. Need this in my bellehhhh. this pie looks amazing! i’m glad you two are reunited!! cashews for the win! and – as always – your photos are incredible. Thanks Jessica! You’re kind. Banana cream pie and I are definitely reunited and it feels SO good ;D Cheers!